In honor of the #Eagles’ amazing #Superbowl win, here is a 1929 photograph of the #Germantown Boys Club football team taken by a local photography studio named Blaul Studios of 334 East Chelten Avenue. The Boys Club had a football team for decades; the team apparently played on many different fields over the years. The location where this photograph was taken is unknown. Top row: Edward Ewing, Henry Jones, Julius Weychert, Harold Brownstein, Edward Taylor, Pere Andrea [advisory coach], Dr. Ralph Mays [team physician]. Middle row: Irvin Little, William Farewell, Norman Wineke, Robert Abbott, Lawrence Bulette, Harry Smith, Arthur McGuigan, James H. Straub [coach]. Bottom row: John Grier, Albert Hampson, Clarence Glatfelter [Gladfelter], Edward McCullough, Adolph Ott, Captain; Joe Davis, Walter Fleckenstein, Wallace Finn. Over the years, it is often incorrectly assumed that the Germantown Boys Club was a club for wayward working-class youth. However, this is incorrect. The Boys Club was founded to provide wholesome entertainment for area children after school. This is illustrated by the boys and young men in the photo, who look healthy and well nourished. Even though this photograph was taken well over 100 years ago, the scene shown in this photograph hasn’t changed all that much. If this scene looks familiar to you, it might be due to the fact that you may have enjoyed a cup of coffee at Uncle Bobbie's Coffee & Books, the café which opened up last year in the very same building shown here. This 1902 view is of the east side of the 5400 block of Germantown Avenue. At that time, the George L. Carnan Apothecary occupied the corner storefront. Many druggists owned drug stores up and down Germantown Avenue for most of the 19th and first three quarters of the 20th centuries. It wasn’t until later in the century that national chains began to move in and force smaller, independent stores like that shown above to close. The Carnan Apothecary wasn’t the first drugstore to occupy the storefront shown above. Charles Eberle also ran his drugstore out of the same storefront, in the 1880s and 1890s. Note that Germantown Avenue had large pavers set into the Belgian blocks; these were used to provide pedestrians with a smooth surface to cross the street. 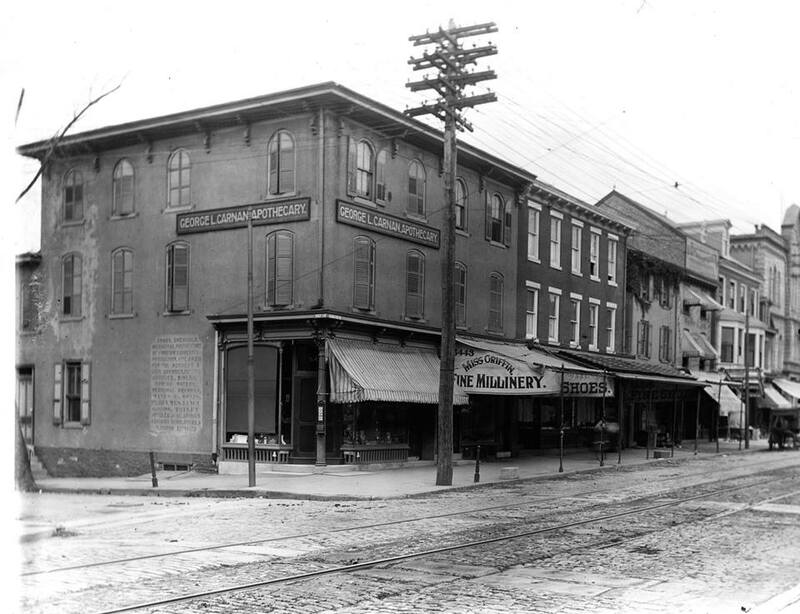 During the 19th century and for much of the 20th century, Germantown’s businesses consisted of many small “mom and pop” stores which were owned and operated by immigrants new to Germantown. Such was the case with the Fuehrer family which owned a small grocery store at 4554 Wayne Avenue for much of the second quarter of the 20th century. The store sold- among other things- candy, cigars, and dry goods. 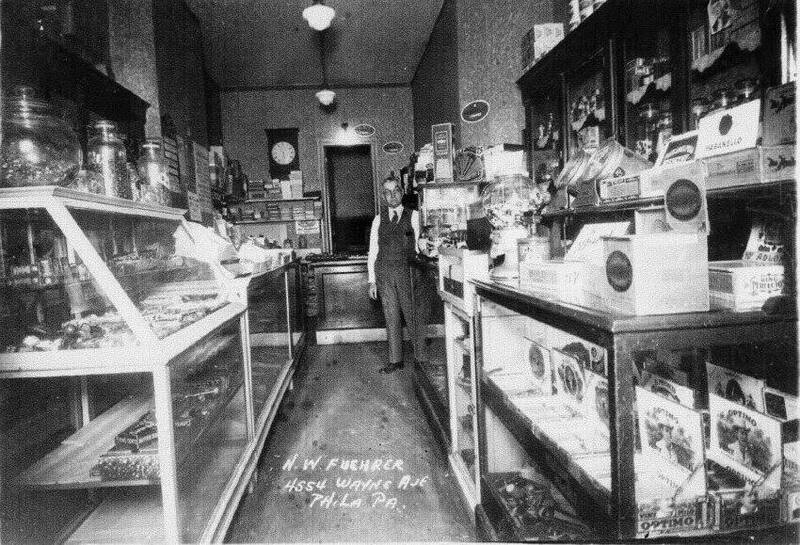 This photograph was taken a short time after the Fuehrers completely renovated their store. The store flourished until after World War II but then fell on hard times. By 1953, the building had become a neighborhood nuisance, with kids vandalizing the building and strewing the rear yard with broken bottles. Sadly, though it appears the building stood for many years thereafter, it ultimately did not survive. A vacant lot is all that remains now, with no reminder available of the building which once stood there or the people who once called it home.